Rodrigo Pessoa and Citizenguard Cadjanine Z. Photos © Sportfot. Wellington, FL – March 8, 2014 – Brazil’s Rodrigo Pessoa jumped to victory with Citizenguard Cadjanine Z in Saturday night’s $280,000 FEI World Cup Grand Prix CSI-W 4*, presented by The Bainbridge Companies, at the 2014 FTI Consulting Winter Equestrian Festival (FTI WEF) in Wellington, FL. The class featured a roster of the world’s top riders and saw a win for the legendary show jumper and his promising new mount ahead of three young U.S. riders. Jessica Springsteen and Vindicat W, Wilton Porter and Paloubet, and Katie Dinan with Nougat du Vallet finished second, third and fourth respectively. Watch an interview with Rodrigo Pessoa after his win! FTI WEF week nine, sponsored by The Bainbridge Companies, concludes on Sunday with the $84,000 Suncast 1.50m Championship Jumper Classic. Please remember to set your clocks ahead one hour for Daylight Savings Time. 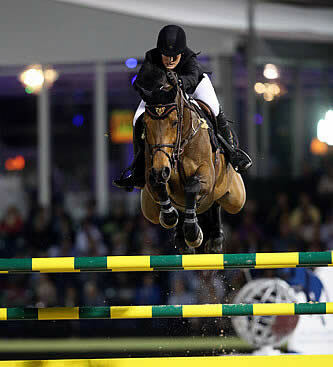 The FTI WEF features 12 weeks of world-class competition through March 30, awarding $8 million in prize money. Alan Wade (IRL) set the track for 45 competitors that qualified during the week to compete in Saturday night’s World Cup qualifying grand prix competition. Seventeen combinations jumped clear to advance to the jump-off and seven of those were able to clear the second round course without fault. Rodrigo Pessoa and Alain van Campenhoudt’s Citizenguard Cadjanine Z blazed to victory in 39.52 seconds. Twenty-two-year old Jessica Springsteen flew to a second place finish with Stone Hill Farm’s Vindicat W in 41.97 seconds. First to go in the jump-off, 20-year-old Wilton Porter set a very fast pace with Sleepy P Ranch LLC’s Paloubet in 42.64 seconds to finish third. Twenty-one-year-old Katie Dinan finished fourth with Grant Road Partners’ Nougat du Vallet in 43.11 seconds. The Leading Lady Grand Prix Rider Award was also presented to Dinan on Saturday night for her success throughout week nine. The award is presented by Martha Jolicoeur of Illustrated Properties in memory of Dale Lawler. For his win, Pessoa was presented with the Herman ‘Kappy’ Kaplan Perpetual Memorial Trophy, established for Kappy with fondness by the Farriers of the 1995 WEF. Pessoa has won the trophy twice before, topping the week nine grand prix in back to back years in 2010 aboard Double H Farm’s Night Train and 2011 with Double H Farm’s HH Let’s Fly. Pessoa started riding Citizenguard Cadjanine Z, a 12-year-old Zangersheide mare (Canabis Z x Feinschnitt I Z), in July of 2013 and has been working on developing a good rapport with what he calls a “special” and particularly quirky horse. The pair made big steps competing in Wellington this winter, including a shared victory with fellow Brazilian Alvaro de Miranda in week seven’s $125,000 Ruby et Violette WEF Challene Cup Round 7. Pessoa has big hopes for the mare and thinks that she has great potential. She has already done big things, including a 2012 Olympic Games appearance in London with Belgium’s Gregory Wathelet. Jessica Springsteen was very happy with her second place finish with Vindicat W, especially since the young rider has been commuting back and forth between Florida and North Carolina for school. She is in her third year at Duke University. Springsteen admitted that although she has gone fast with Vindicat before, this was probably the fastest she has gone while still leaving the fences up. “That’s my problem. I usually go a little bit too fast and get too much going, so I tried to keep it together,” she stated. Third place finisher, Wilton Porter, is also a young rider traveling back and forth from school as a freshman at Vanderbilt University in Tennessee and has faced the added challenge of staying up to par to compete against the world’s best riders in Wellington. Stephanie Danhakl took both the division champion and reserve champion title on Saturday morning in the FarmVet Amateur-Owner Hunter 18-35 3’3″ division during week nine of the FTI WEF. Danhakl, of Palisades Park, CA, and her eight-year-old Warmblood gelding Enough Said earned the championship title after winning every class in the division. Danhakl also finished as reserve champion with her other horse, Quest. The pair was second, third, and second over fences and third under saddle. Danhakl, 27, was extremely happy with her horses’ performances in the division, especially since she has only owned them since the end of last year. “It’s really exciting. I definitely wasn’t expecting for them to be so consistent this early on. I knew they’re both great horses, and it’s been really exciting to be able to ride them. I feel like we’re just starting to figure them out, which is really fun. They both have a lot of scope and give you a great feeling over the jump,” Danhakl commented. Danhakl, who trains with Scott Stewart and Ken Berkley at River’s Edge Farm, admitted she is slightly more comfortable on Enough Said since she has had a few more weekends to show him than Quest, who Danhakl has only competed twice before week nine of the FTI WEF. “Our styles are really compatible because [Enough Said] is the kind of horse that you just kind of loop the reins and don’t use a lot of leg, and that’s how I like to ride. You’re basically just steering around the course and being really soft,” Danhakl described. That soft ride is what Danhakl believes makes him so competitive, along with how adjustable Enough Said’s stride is. “He’s got a huge stride but if you jump in big, you just put your shoulders back and he fits the strides in perfectly. I think it makes for a very soft, nice, hunter-y way of going. I’m able to ride him pretty smoothly, and he likes that kind of ride,” Danhakl explained. From the first time she tried him, Danhakl liked the way Enough Said went, but what attracted her to him most was his puppy-dog personality. “He’s such a sweet horse. He always has his head sticking out of his stall looking for treats, and he is very loving. He loves to be pet; he acts more like a Golden Retriever. I love to spoil my horses. He’s just been getting progressively more spoiled! Other people will walk up to him, and he’ll start going at their pockets for treat. Maybe I’ve gone a little overboard!” Danhakl laughed. The most preparation Enough Said needs is a tour around the ring at the beginning of the show week, when Danhakl is more than happy to let him peek at anything that may catch his eye. “He likes to go in the ring in the morning, at least the first day, and look around. He’s not spooky at all, but he likes to look sometimes outside of the ring if there’s a photographer or a sign or things like that. I just let him look, and he doesn’t ever spook. I don’t feel like he needs to focus 100% of the time, so I think he appreciates that I allow him to look around and I trust him not to spook,” Danhakl described. While Danhakl is originally from California, she moved east for college and is currently in graduate school at the University of Pennsylvania getting her master’s degree in Art History. She commutes back and forth from Philadelphia each week, which she acknowledged can be exhausting, but is well worth the opportunity to escape the cold and enjoy her horses. Hunter competition for Week 9 of the FTI WEF, presented by The Bainbridge Companies, concludes on Sunday morning with the Sylvester Center Adult Amateur Hunter 36-50 division in the Rost Arena. For full results, please visit www.showgroundslive.com. FTI Consulting, Inc. is a global business advisory firm dedicated to helping organizations protect and enhance enterprise value in an increasingly complex legal, regulatory and economic environment. With more than 4,000 employees located in 24 countries, FTI Consulting professionals work closely with clients to anticipate, illuminate and overcome complex business challenges in areas such as investigations, litigation, mergers and acquisitions, regulatory issues, reputation management, strategic communications and restructuring. The company generated $1.58 billion in revenues during fiscal year 2012. For more information, visit www.fticonsulting.com. The 2014 FTI Consulting Winter Equestrian Festival has 12 weeks of top competition running from January 8 through March 30. The FTI WEF is run by Equestrian Sport Productions, LLC, and Wellington Equestrian Partners and held at the Palm Beach International Equestrian Center. All 12 shows are “AA” rated and Jumper Rated 6, and more than $7 million in prize money will be awarded. Lauren Fisher and Laura Cardon for Jennifer Wood Media, Inc.